As seen in "MythBusters: Moon Landing Hoax." Explanation: Despite the old saying "seeing is believing," a 1999 Gallup poll found that 6 percent of Americans don't think the televised Apollo moon landing ever happened. Instead, skeptics claim it was an elaborate hoax cooked up by the government. Skeptics' exhibit A: NASA's photo of an astronaut taking a moon stroll with some rocks in the foreground. To doubters, the image is obviously doctored because the astronaut's shadow isn't parallel to those of the moon rocks. If in fact the picture was taken on the moon with the sun as the sole light source, hoax advocates say, the shadows would all fall in a parallel direction, or plane. MythBusters Jamie Hyneman and Adam Savage shed light on the shadowy controversy by arranging their own lunar photo shoot. After constructing a moon-landing scene to scale and adjusting the topography to mimic the moon's, the sun-like lamp shining on the uneven surface cast non-parallel shadows on the mini astronaut and imitation moon rocks. The moon-photo conspiracy theories don't stop there, however. Critics also claim that an image of Neil Armstrong exiting the landing module must've involved additional lighting. The area surrounding Armstrong is completely overshadowed, yet he's fully illuminated. How? 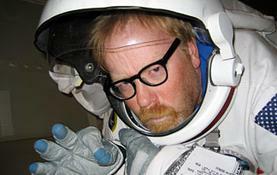 The MythBusters believed that regolith — moon dust — was to blame. Regolith, a powdery mix of minerals, reflects sunlight back to Earth, which allows us to see the moon in the sky. Jamie and Adam whipped up some fake regolith with the same reflective property of the real stuff and returned to their lunar photo set. Positioning their sun-like light above a miniature Neil Armstrong and space vehicle, the MythBusters' photos revealed that despite the surrounding shadows, the sunlight's reflection on the regolith spotlights him up for the famous photo op. In the end? MythBusters: 2. Moon landing skeptics: 0.